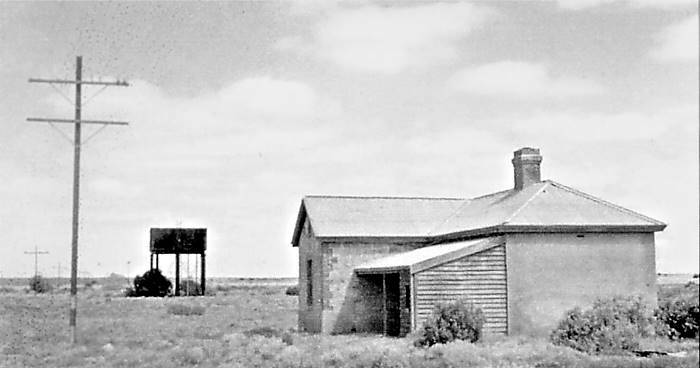 As early as the 1860s, mineral discoveries in the Flinders Ranges prompted the authorities to consider the merits of building a railway north from Port Augusta. The initial plan was to build a line 200 miles into the interior. Several routes were considered but eventually it was decided to construct a railway through the Pichi Richi Pass, across the Willochra Plain to Wonoka (present-day Hawker), through Nooltana Gap to the plain on the western side of the Flinders Ranges then generally northward. 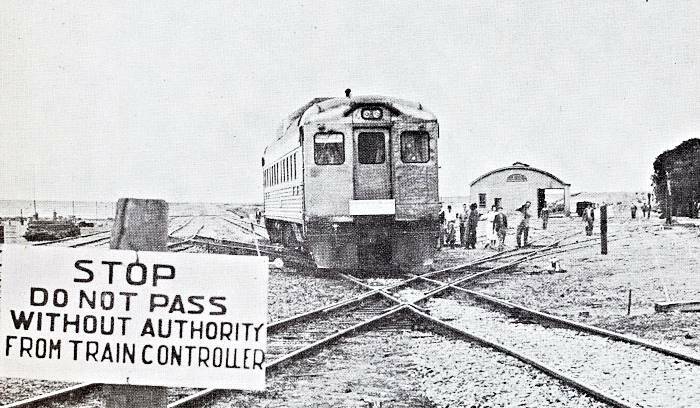 By the late 1870s the proposed railway was popularly viewed as the first section of a transcontinental railway to link Port Augusta with Darwin (then known as Palmerston). The line was declared open at a ceremony in Quorn by the Governor of the day Sir William Jervois on 22 May 1882. Henceforth Government Gums was known as Farina: Latin for flour, as the tablelands to the east were intended to be the northernmost agricultural area. Initially Farina may have been the intended terminus but by the time construction of the line was under way most people realised that there would be no wheat to carry from Farina. Even before the railway had been opened to Farina the nature of the traffic it would carry changed from wheat and minerals to cattle, sheep and wool. 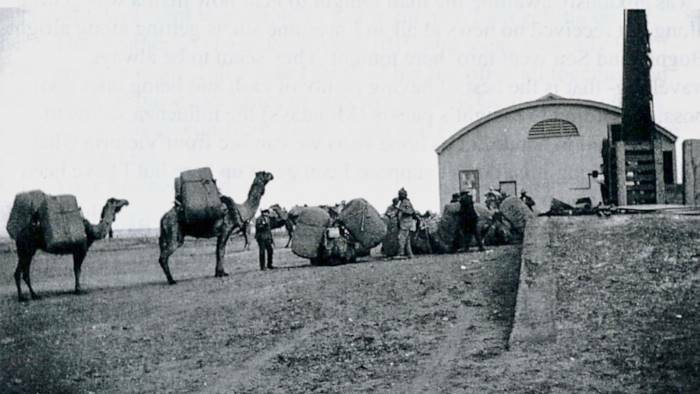 In1882-1883 nearly 15,250 bales of wool were transported to southern markets – notably Adelaide – compared with 13,880 in 1881-1882. For two years Farina was the railhead for the Oodnadatta, Birdsville and Strzelecki Tracks. 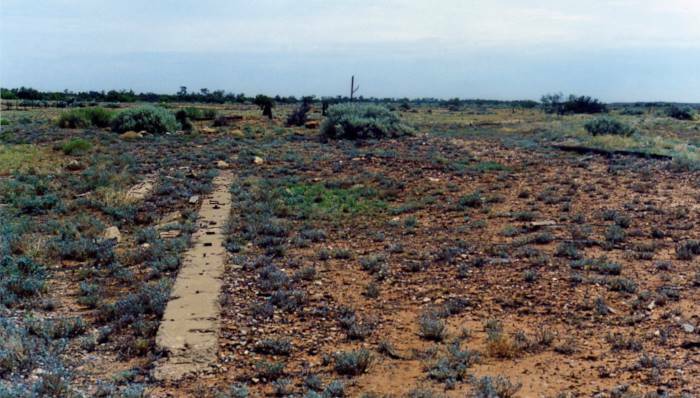 But an extension of the line beyond Farina to Marree (then known as Hergott Springs) was logical to tap into livestock travelling from pastoral leases west of Lake Eyre and down the Birdsville Track from the north-east. The extension beyond Farina to Hergott Springs was officially opened on 7 January 1884. Initially Farina boasted a standard four-track layout, a wooden Class 2 station building, a residence for the station master and his family, a corrugated iron arched roof goods shed and loading platform, the buildings being erected by Sara & Dunstan for just over 3,943 pounds. Locomotive facilities included a single line running shed, coal stage, and water column fed from a 25,000 gallon overhead tank whose contents came from a 5,000,000 gallon reservoir. 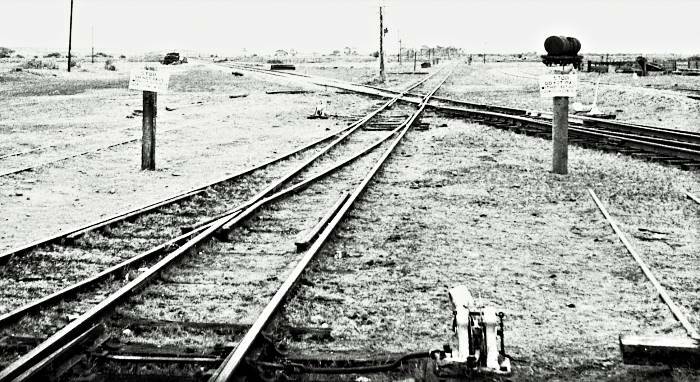 As ample land was available, instead of going to the expense of installing a turntable, a turning triangle was laid out on the eastern side of the railway. Wherever possible – particularly in the days of steam – it was desirable that the engine work “funnel first” as opposed to “tender first” which in effect was running in reverse. Despite the smoke from the engine’s chimney, the visibility – particularly of the track ahead – was better, a headlight assisted with night time working, the cab afforded better protection from the elements for the crew, and the engine’s front end was better placed to deal straying animals. By contrast running in reverse meant the lack of a headlight, the crew were more exposed to the elements – with coal dust blowing back into the cab as well, and the engine didn’t “track” as well as running “funnel first”. a huge girder ranging in diameter from 53 feet to 85 feet. Another option was the balloon loop – a giant rail circle where the entire train went through 180 degrees and ended up back at the start of the circle. (See opposite – Marree loop). The reversing triangle. As the name implies this clever device consisted of a three-sided rail arrangement. Engines (and sometimes whole trains) reversed up one leg of the triangle and onto an apex spur, a line which varied in length from the length of an engine to several hundred feet if the line was used, say, for loading stock. The movement then came forward on the other leg of the triangle and had thus gone through 180 degrees in the process. Generally speaking if land was at a premium, then a turntable was installed. If there was plenty of space then a triangle was often the preferred solution. Over time triangles were installed at a number of sidings – including Farina – to facilitate the working of trains to and from these intermediate stations. This particularly applied where the running of livestock specials was concerned. Over time the far north of South Australia, western Queensland and central Australia became a patchwork of pastoral leases – many of the pastoralists following in the footsteps of the builders of the Overland Telegraph Line – progressively opening up the country. What a welcome sight the coming of the Great Northern Railway must have been to these early pastoralists. Every new mile of railway line laid northwards, meant one less mile of cattle droving southwards. Whilst most railway sidings were equipped to load livestock, there were a few stations that became, over time, great livestock trucking dispatch points. Farina proved to be one such station. The legendary cattle king Sidney (later Sir Sidney) Kidman assured Farina of a steady volume of livestock traffic when he acquired Mundowdna station centrally located between Farina and Hergott Springs (today’s Marree). This 998 square mile property had reliable water, and equally importantly, good feed consisting of edible bushes and grasses. (or Marree) for desptach south by rail. Whilst some properties stocked sheep, lack of reliable (permanent) water and the depradations of the dingo made sheep farming marginal at best.With the opening of the railway to Farina by 1882, 8000 head of cattle used the Strzelecki Track to reach the Farina trucking yards. By 1910 Kidman alone trucked 18000 head of cattle from Farina. By 1911 Farina boasted sheep yards for 2800 sheep and yards for 900 head of cattle. Initially, in the South Australian Railways’ era, small “Y” class steam locomotives hauled 225-ton livestock trains. 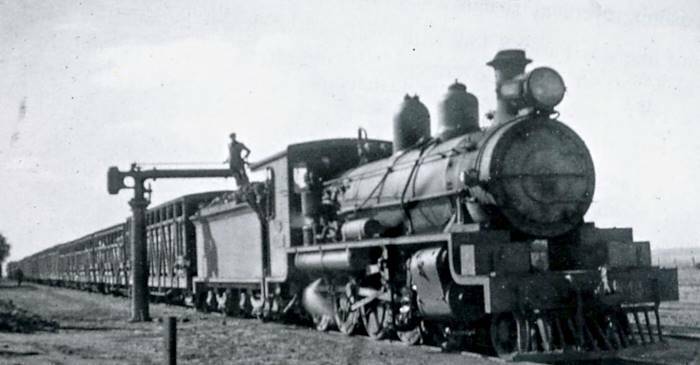 The opening, by the Commonwealth Railways, of the line between Oodnadatta and Alice Springs in 1929 saw the introduction of the larger and more powerful NM class steam engines capable of hauling 330-ton trains. 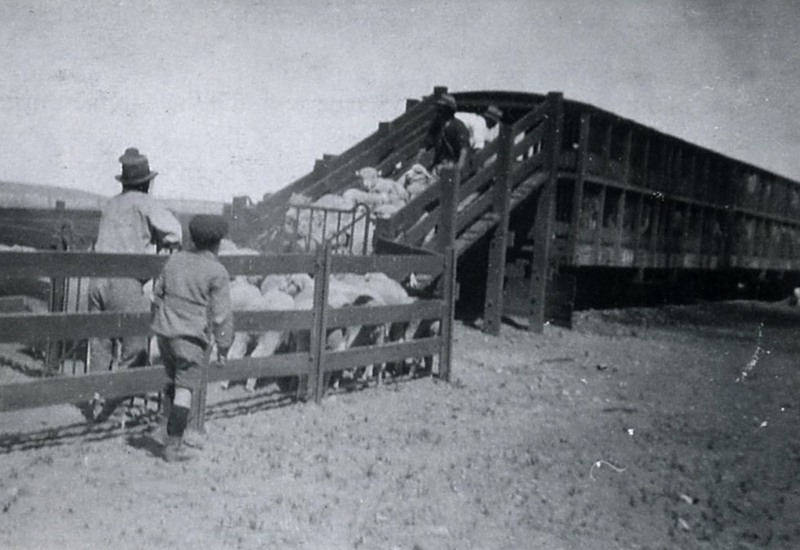 Up until 1955 livestock from Farina was railed to Terowie and then transshipped into waiting broad gauge vans for the 135 mile trip to Dry Creek and the Adelaide abbatoirs at Pooraka. Livestock trucks came in 4-wheel and bogie versions. 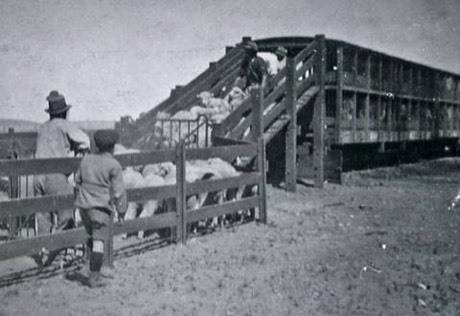 Bogie sheep trucks had four compartments (upper and lower) each of which could accommodate 50 sheep (fully loaded – 200 sheep in all four compartments). Bogie cattle vans could carry 18 beasts. During the 1950s the number of livestock dispatched from Farina fluctuated wildly from year to year. In the 1952-3 season, 3271 were despatched. This rose to 8282 in 1956-7 and was down to 3626 in the 1958-59 season. 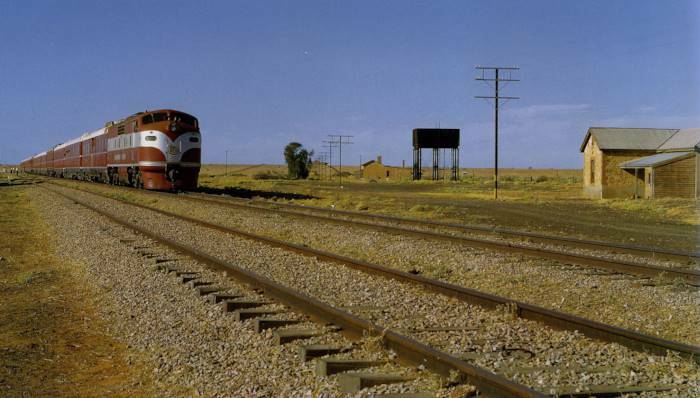 At this time the major cattle trucking stations on the Central Australia Railway (CAR) were Alice Springs, Marree, Oodnadatta, Finke, Deepwell and Abminga. In 1958-59 severe drought conditions saw nearly 146000 head of cattle railed from various sidings on the CAR to southern states where feed was available. This proved to be the greatest number moved by rail since 1911. 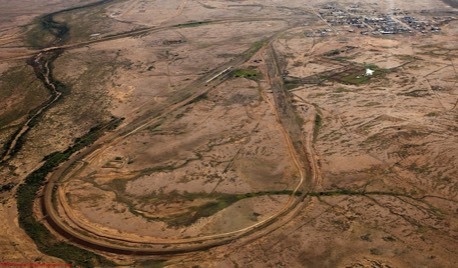 Given the nature of this type of traffic – especially mobs coming down, say, the Birdsville Track – trains couldn’t be run on any regular basis, but were arranged to operate “as required”. Care had to be taken to run empty livestock trains north timed to meet and load southbound consignments at pre-determined stations (which would invariably have included Farina) en-route. Orders for trucks were expressed in terms of “vans” of cattle. It needs to be borne in mind that originally all railway trucks were of the four-wheel variety. Even though bogie (8-wheel) trucks were in vogue in the USA by the 1850s, the 4-wheel tradition “stuck” and so a van of livestock was deemed to be the equivalent of a 4-wheel vehicle. By extension, a bogie truck represented 2 vans of cattle. To calculate the actual numbers of bogie cattle trucks that made up a livestock special, simply halve the quoted number of “vans”. An odd number of “vans” of cattle eg 7, equated to 3½ bogies (four trucks in total). There were rare occasions when it was more convenient to unload cattle between stations. Given that there would be no ramp facilities at such locations, this was done by stopping the train, opening the truck doors, and allowing the cattle to literally jump out onto the ground! It would have been surprising if there weren’t some serious leg injuries sustained by some of the cattle, as a result of this practice. Opening of the Quorn and Farina Railways. The formal opening of the further extension of the Great Northern Railway, vis., from Orroroo to Quorn and thence to Farina, took place at Quorn on Wednesday, the 17th inst. His excellency the Governor performing the ceremony in the presence of a very large and representative gathering from all parts of the colony, the importance of the occasion being heartily entered into by all present. Invitations had been supplied to a large number of influential persons to accompany the Ministry, and Members of Parliament, and add to the éclat of the proceedings, and about 500 of whom left Adelaide in a special train on Tuesday morning, reaching Terrowie at about 2 o’clock. Here an unwise break occurs in the gauge – from 5ft. 6in. to 3ft. 6in. – and about an hour was spent in refreshments, abundantly spread in the goods shed. Quorn was reached at about half-past 7, a distance of 234 miles from Adelaide. This is now a large and busy junction between Port Augusta and Farina, a tremendous stride having taken place here since the commencement of the work. Three fine hotels do well we are told, besides several stores, mills, and manufactories, the latter mostly devoted to the production of agricultural implements, wagons etc. Immediately upon the arrival of the train, a dinner was indulged in at the goods shed, which had been temporarily enlarged for the occasion. Hi excellency the Governor and party went from Adelaide to Port Augusta by coasting steamer, and arrived at Quorn by the Port Augusta tram on Wednesday at about noon, when addresses were presented in the presence of a large and enthusiastic crowd, who gave vent to their joy in sundry bursts of applause whenever occasions offered. At 1 o’clock the Banqueting Hall – the goods shed – was again visited, and over 300 guests sat down to a most sumptuous repast prepared by Mr. Besch, of Adelaide, by whom also the other previsionary arrangements on the road, etc., were made. After due justice had been done to the good things on the tables, the loyal and incidental toasts were proposed, honoured, and responded to, the main feature of the evening being the Governor’s and Ministerial speeches. From the latter we learned that the Railway is to be extended to Bagot’s Springs, and further extensions in various directions are being asked for in the ensuing Parliament, amounting to in all, about 750 miles. Reductions in the charges on goods traffic are to be made about June next of 5 percent on goods travelling under 100 miles, 10 percent under 200, and 20 percent over that distance. In passenger traffic a reduction of fares is also to come into effect at the same time; third and return tickets are to be abolished, first class fares are to be reduced about a third, and second class to half the present rates, which will in effect be a reduction of about one-sixth on both classes. These and other statements of the Chief Secretary and Commissioner of Railways and Public Works were received with early applauses. After the Banquet was over the Ministerial and Parliamentary party proceeded by train to Beltane, a few other unlicensed persons surreptitiously crowding themselves into the train, much to the annoyance of the hon. Commissioner, who however magnanimously allowed them to proceed. Beltana was reached about half past 10, and after another bout of refreshments beds were sought. Next morning (Thursday) the train continued its northern journey to Farina, a distance of 451 miles from Adelaide where unfortunately no reception had been provided by the inhabitants, through some error of there authorities in not acquainting them officially as to the time the party might be expected. After a short stay the train returned to Quorn, and thence to Port Augusta. The other portion of the guests went by special train from Quorn to Farina on Thursday, starting at 9 am. and arriving at about 10.30pm. The people of Farina were in a state of enthusiastic commotion, and gave the visitors a hearty reception. Guns and firearms were fired, and the whole population turned out and cheered most vociferously. After supper the visitors were invited to the assembly room, where liquors were provided, and the usual toasting was indulged in. Mr. Perry, the chairman, as the mouthpiece of Farina-ites expressed disappointment and disgust of the people at the treatment they had received in not being officially acquainted with the opening of the line to that terminus, and his sentiments were freely endorsed by the several speakers who followed. Some of the visitors in responding to toasts submitted that the omission, from the well known amiability and honesty of the hon. Commissioner, could not have been intentional, and must have been the result of a mistake or oversight. At the conclusion of the meeting representatives of the press from Mount Gambier and Strathalbyn in the south, and Port Augusta and Port Pirie in the north responded, and all wished every success to the people of Farina and their railway. On Friday morning, at daylight the visitors turned out after about 40 winks to view the township, which boasts of two hotels, several stores, and a good number of well built houses, and a large number of navvies’ cottages. An early breakfast was taken, and the train at 6.30 started for Quorn, which was reached at about 7.45pm. 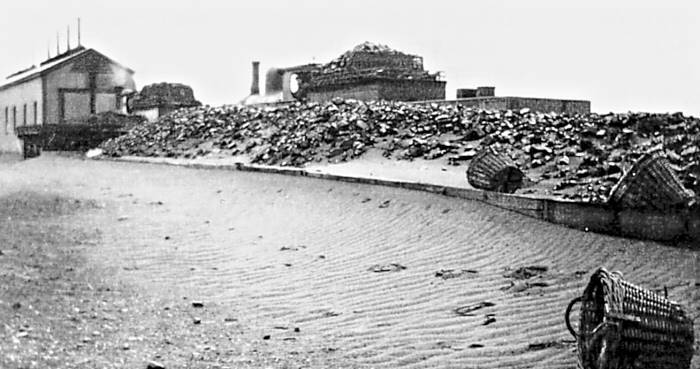 The country travelled through was very poor and dry, consisting of immense plains, divided occasionally by low ranges, the flats at the southern side of Beltana being decidedly more promising than those beyond. Along the ranges some nice tracts of good agricultural land cropped out, which if rain were only dependant enough, looked as likely for grain as any land down south, good black rich looking soil: but unfortunately in the absence of rain scarcely a blade of grass is now to be seen. Salt bush is abundant, and in some spots is looking nice, fresh and green after the recent small showers the country has been favoured with. At the several stations on the road also hotels and stores seem to do a large business if one may judge by the size, style and elaborate furnishings that a brief rest at each allowed us to note not inferior to many houses on the road, a hundred miles nearer the metropolis. No running creeks were crossed, but any number of culverts, short and long bridges, over water courses where evidently at times the water must come in immense floods. If this waste water was conserved, this country would doubtlessly be infinitely more valuable. Beyond Farina we noticed a belt of gums showing the course of an at present dry creek, and beyond, the plains extended we were told uninterrupted for perhaps a hundred miles. From Farina we learned several teams regularly travel with stores to the western side of Queensland, a regular trade being done across colony. The country in some parts is very wild and rugged, the Walpina and Mount Deception ranges presenting remarkable contrasts to the intervening vast plains, and the absence of timber is most noticeable, the gums along the creeks being a very stunted and dwarfish description. The steam horse appears to have frightened the emu and kangaroo away, for not a dozen altogether were seen during the trip, though we were told they were otherwise very numerous. The weather was exceedingly fine the whole trip, the sun being powerfully hot, and the sky as clear and free from clouds as though it were mid summer instead of mid winter. The nights were however cold and frosty, and the air deliciously sweet. As an instalment of the Great Transcontinental Railway to Port Darwin, as a feeder to the interior and our own ports, a main trunk of feeders from Queensland and New South Wales, this is decidedly one of the boldest and most promising steps South Australia has taken, and the hundreds who were thus afforded an opportunity of seeing the country, agreed that it was a step in the right direction; but further extension must follow as speedily as possible, to enable the present generation to participate in the general increase of prosperity that is therefrom looked to arise to South Australia. It will be a grand day for South Australia when direct communication is established between the Northern and Southern extremes and also between South Australia and the sister colonies. On Saturday morning a special train took the visitors from Quorn to Adelaide, which was reached in safety at night time, not a single accident or hitch having occurred, we are glad to say, during the week, owing to the admirable arrangements made by the authorities, of the railway itself, and the rolling stock, we can speak in the high at terms, the only pity being the break of gauge which occurs at Terowie. This should not have been, but as it is so, we presume the remainder of the line will be finished in the same guage. The carriages were comfortable, and we noticed no more oscillation on the narrow than on the broad gauge though perhaps the speed could not be attained on the narrow that the broad gauge would allow. In conclusion we have to thank the hon. Commissioner of Railways for the opportunity afforded to the public of seeing for themselves this great work, and for the thoughtful provision that was made for the comfort and convenience of his guests all through the trip. Certainly South Australians, or at least Adelaideans, will now, from personal observation, know more about the Northern country than they knew before, and will be able to judge as to the wisdom of extending the line and feeding it with branches in the future. When our own line to Strathalbyn and Goolwa is completed, we trust a similar opportunity will be afforded to the citizens and northerners to visit our great seaport at Victor Harbour, and its great feeder the lower part of the River Murray.